Magi is a tale greatly inspired by the Western translations of the literary classic One Thousand and One Nights. 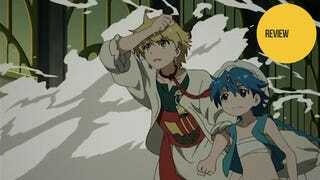 In fact, the three main characters of Magi are Alibaba and Morgiana (from Ali Baba and the Forty Thieves) and Aladdin. Other characters from One Thousand and One Nights show up as well—including Sinbad the Sailor, among others—but what's most interesting about the characters is how they reflect their literary counterparts but, at the same time, are completely new characters. Morgiana, for example, is still a slave as she was in One Thousand and One Nights but now, instead of being the clever one, she is the most physically powerful. Aladdin, on the other hand, has a completely new backstory but still has a genie—though now in a flute, not a lamp or ring. It is quite interesting to compare Magi with One Thousand and One Nights as you watch to see what was kept from the original, what was changed, and what effect these changes have had on the story. objects—power far beyond that of normal men. On the other, it's the story of a boy who rides around on a headless genie and a girl who can kick people in half. Simply put, Magi is an anime where you feel that literally anything could happen at any time. It is an adventure in the purest sense where the world seems full of limitless possibilities. Mixed — Hey, Where'd My Main Characters Go? that Aladdin and Alibaba inhabit. On the other, it's hard to become invested in any of the newly introduced characters when A) you know that they'll probably never be heard from again once the episode is done and B) a main character you're already highly invested in is suddenly, inexplicably written out of the story—albeit temporarily. As the anime approaches the midway point, the traveling and adventuring grinds to a halt for the series' first big climax. At this point the show suddenly becomes a shonen anime like Bleach, Naruto, Dragon Ball, or—most aptly—Shaman King. The main characters each find themselves pairing off against enemies for climactic boss battles and/or train vigorously to learn new super attacks. While still fun and exciting, around the mid-point, Magi feels much more cliché and formulaic than it did starting out. Magi, especially in the beginning, gives the feeling of being immersed in pure creativity. It's a great re-imagining of classic literature and only gets better if you're familiar with the source material. And even as it becomes more grounded and formulaic toward the mid-point of the series, it's still got a compelling enough mystery to keep you tuning in. Magi currently airs on TBS in Japan. It can be seen free and subtitled in English on Crunchyroll and Hulu. Come back in a few months to see our Kotaku East review of Magi's second half.